There are many creative ideas to consider for a slumber party that will keep your kids entertained and out of trouble. Both boys and girls of all ages can enjoy a variety of fun activities, games and food while spending the night with friends. Allowing the girls to experiment with different make-up and even let them try it out on one another. Have different hair products on hand as well so the girls can give each other new hair styles. Hair bands, ribbons, barrettes and clips can make for a fun hair style as well as using flat irons or curling irons. If using heat instruments, be sure to have an adult supervise the girls. Take before and after photos with your digital camera, and print them off for the girls to take home in the morning. Ask each girl to dress in pink or to bring a pair of pink pajamas. Decorate with pink balloons and streamers. Place pink pillows and blankets around the sleepover area. Serve pink food such as pink cupcakes, pink doughnuts, pink punch, and strawberry ice cream. You can give each girls party favors such as pink nail polish, pink stickers or pink lip gloss. As an activity, have each girl make a scrapbook page using pink supplies. Take a photo of the girls for them to use on their scrapbook page. Have the boys dress up in plain white pajamas or purchase inexpensive white shirts and pants to use as a karate outfit. Watch movies such as the Karate Kid or Three Little Ninjas. Serve an array of "kid friendly" Chinese and Japanese foods. Roasting marshmallows in your fireplace or on the grill to make s'mores. Renting a camp-theme movies like RV or Camp Nowhere. Telling scary stories before going to sleep. Choose three board games and have the kids take turns playing each game with one another. For a bit more competitiveness, you could even bracket the games like the NCAA tournament (teen boys would get a kick out of this system). Serve food you find at stadiums such as hot dogs, soda, and nachos. Serve movie snacks such as popcorn and candy as well as plenty of pop. Display posters of movies and favorite actors. Make a game of movie trivia and ask questions related to popular movies and stars. 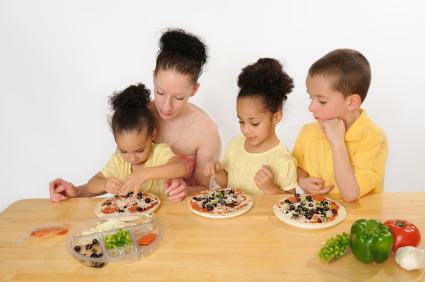 Have the kids can help you prepare supper and breakfast the next morning. Be sure to lay out utensils, ingredients, and several copies of the recipes before your child's friends arrive. Single-serve entrees and desserts allow each child to participate fully. Younger kids may need closer supervision, but most teenagers may only need helpful hints. Some fun ideas include decorating pre-made cupcakes or brownies, making crispy rice treats and or creating mini pizzas from premade pizza dough and a variety of cheese and toppings. You can provide aprons for each child and as a party favor give them an apron and recipe to take home. 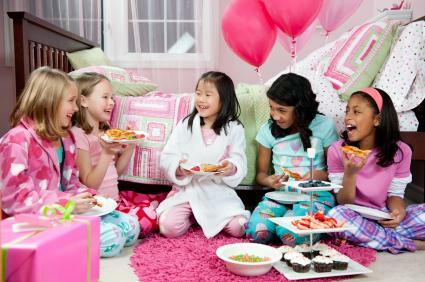 Having a birthday slumber party is a popular choice for kids of all ages. You can do an activity with your child and her friends such as bowling, skating or a dinner out then come home for birthday cake, ice cream and more fun. Since you provided entertainment for most of the evening, you can allow the kids to enjoy each other's company and relax by watching a movie. 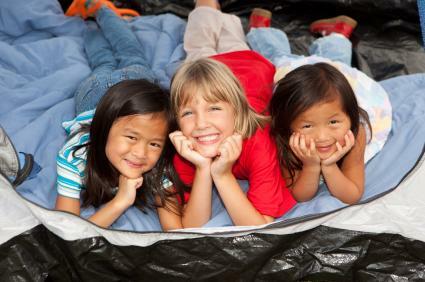 A birthday party sleepover can begin as co-ed and allow both boys and girls to enjoy the fun but after the party, try to stick to the sleepover by keeping the overnight guests the same gender. Ask each child to bring a sleeping bag, blanket and pillow. Serve food such as hot dogs and s'mores. Give each child a flashlight, which can double as a party favor. You can do activities such as star gazing, flashlight tag and telling ghost stories. Use a large white sheet as a movie screen and hang it on the side of your house or on a railing. You can bag up popcorn and other treats for the kids to enjoy while watching the movie. Once the movie is over, you can move the party back indoors for more overnight fun. Set up an area with hot chocolate and fun toppings such as mini marshmallows, whipped cream, candy canes, and chocolate sprinkles. 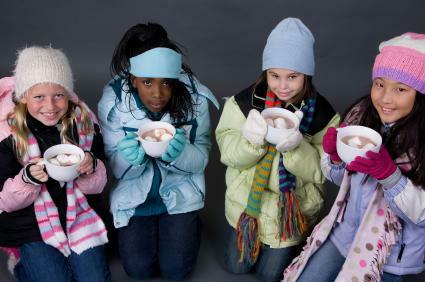 If you have a fireplace, have the kids set up their sleeping bags in front of it to keep warm after being out in the cold. Rent a movie and order a pizza and just and allow everyone to relax after a long day of winter activities. Activities such as tree decorating or cookie baking are fun for all ages. You can purchase inexpensive glass ornaments and paints and allow each child to decorate an ornament to take home and hang on their tree. Play Christmas music and your child's "must see" Christmas movies. Serve Christmas cookies and snacks. The next morning serve a breakfast such as French toast or pancakes and have the table decorated in a festive style. Have the kids make their own breakfasts, or take your teens out to a pastry and delicatessen for a morning brunch. A brisk walk or watching television can keep the kids occupied before they have to leave. Make sure you have a list of who is getting picked up or dropped off, and what time that needs to happen. Slumber parties are a fun way to spend time with friends. Kids can enjoy a range of of fun things to do that are sure to create a wealth of memories.